Here’s as good a chance as any to enjoy the Sam Lloyd career highlight to date, an after-the-siren match winner from a 45° angle in 2016. Drafted as a mature age player in 2013 and hitting his peak so far in 2016, Lloyd was on a hiding to nothing staying at the Tigers. Much like Anthony Miles, he was a key contributor in Richmond’s surprisingly poor 2016, was marginalised in the march to the premiership, and now does not figure in the Tigers’ future plans. Both have fallen victim to the Tigers strength at their relative positions, in Lloyd’s case as both a small forward and a midfielder. Unlike Miles, he’s a bit older, and was only about half as good at his peak. Lloyd will be 29 in March, he’s played 15 of a possible 50 games in the last two years. On our model, he was projecting to exit the AFL in the relatively near future. He probably still is, but the Dogs must surely be more likely to find a use for him. The trade is a token one, being a swap of the Bulldogs’ fifth current selection for him to become Richmond’s third current pick. The pick was precisely chosen, with the Dogs very specifically parting with pick 64 and not the pick 63 immediately prior. It is also two picks above the pick 66 at which Lloyd was originally selected in 2013. 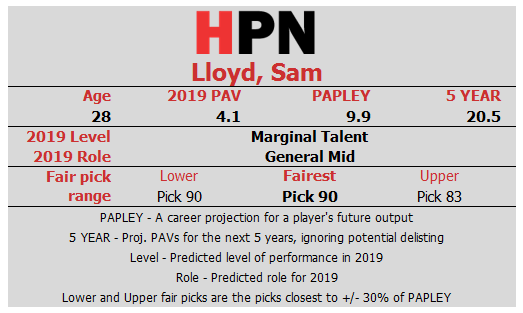 The pick has a higher expected value according to our draft chart, but it won’t take much for Lloyd to outperform his projection. His 2016 was worth 11.5 PAVs, so one good season will do it. Next Post:Have North found the Hall way to success?